A powerful approach to analysing quantum systems with dimensionality d>1 involves adding a weak coupling to an array of one-dimensional (1D) chains. The resultant quasi-1D (q1D) systems can exhibit long-range order at low temperature, but are heavily influenced by interactions and disorder due to their large anisotropies. Real q1D materials are therefore ideal candidates not only to provoke, test and refine theories of strongly correlated matter, but also to search for unusual emergent electronic phases. 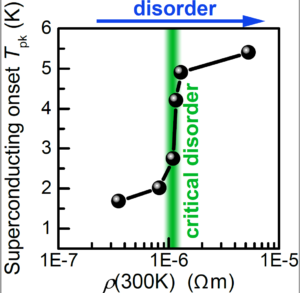 Here we report the unprecedented enhancement of a superconducting instability by disorder in single crystals of Na2 dMo6Se6, a q1D superconductor comprising MoSe chains weakly coupled by Na atoms. We argue that disorder-enhanced Coulomb pair-breaking (which usually destroys superconductivity) may be averted due to a screened long-range Coulomb repulsion intrinsic to disordered q1D materials. Our results illustrate the capability of disorder to tune and induce new correlated electron physics in low-dimensional materials.